Liberty's Kids, episode 34, Deborah Samson, Soldier of the American Revolution. This story is incredible in more ways than one. The story is not only true, but Deborah Samson is also descended from William Bradford. In 1778, she wanted to enlist in the army as a Continental soldier. Women were not allowed to do this, so she disguised herself as a man. She had little difficulty passing as a man because she was five feet seven inches in height, which was tall for a woman at that time. 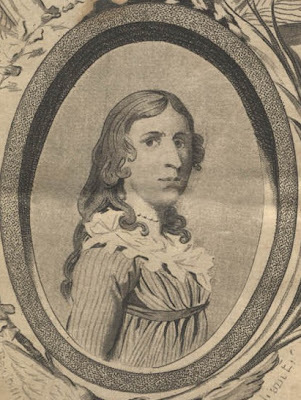 On May 20, 1782, she successfully enlisted in the army on the master of Master Noah Taft of Uxbridge, under the name of her deceased brother, Robert Shurtlieff Sampson, and gave his/her residence as Uxbridge, Massachusetts. Her signature still exists in the Massachusetts records. Sampson was chosen for the Light Infantry Company of the 4th Massachusetts Regiment under the command of Captain George Webb. The unit, consisting of fifty to sixty men, was first quartered in Bellingham, Massachusetts and later the unit mustered at Worcester under the Fourth Massachusetts Regiment, commanded by Colonel Shepard. Sampson fought in several skirmishes. During her first battle, on July 3, 1782, outside Tarrytown, New York, she received two musket balls in her thigh and an enormous cut on her forehead. She begged her fellow soldiers to let her die and not take her to the hospital, but they refused to abandon her. A soldier put her on his horse, and they rode six miles to a hospital. The doctors treated her head wound, but she left the hospital before they could attend to the musket balls. Fearful that her true identity would be discovered, she removed one of the balls herself with a penknife and sewing needle, but her leg never fully healed because the other ball was too deep for her to reach. On April 1, 1783, she was promoted and spent seven months serving as a waiter to General John Paterson. This job entitled her to a better quality of life, better food, less danger, and shelter. After the peace treaty was signed, everyone thought the war was over. However, on June 24, the President of Congress ordered George Washington to send a fleet of soldiers to Philadelphia, Pennsylvania, to aid in squelching a rebellion of several American officers. During the summer of 1783, Sampson came down with malignant fever and was cared for by a doctor, Barnabas Binney. He removed her clothes to treat her and discovered the cloth she used to bind her breasts and, thus, discovered her secret. He did not betray her; he took her to his house, where his wife and daughters housed and took care of her. After Sampson recovered, she returned to the army, but not for long. In September 1783, peace was assured through the signing of the Treaty of Paris. November 3 was the date for the soldiers to be sent home. When Dr. Binney asked her to deliver a note to General John Paterson, she thought that her secret was out. However, General Henry Knox never uttered a word; instead, she received an honorable discharge from the service, a note with some words of advice, and a sum of money sufficient to cover her expenses home. On October 25, 1783, General Knox honorably discharged her from the Army at West Point, after a year and a half of service. On the wiki link above, you will see the relationship between Deborah Samson and William Bradford. And here is where we are going to fill in the story about William Bradford. Click on the icon at the bottom right of the container to enlarge for better reading. The story that begins religious freedoms in colonial America and fair government. Principles that go hand and hand. Exactly what we continue to see disappearing before our very eyes each and every day. Free downloads are available on the above e-book from our SlideShare site. You will have to log in with either your Facebook account or LinkedIn account or set up a free account for the download. We will be covering more on Williams Bradford around the Thanksgiving season. So stay tuned. It will be very interesting as we cover the arguments of the location of where the real first Thanksgiving took place and not the one often mentioned most often. But again, that is for a future date. Puritan Ideology in Bradford's "Of Plymouth Plantation"